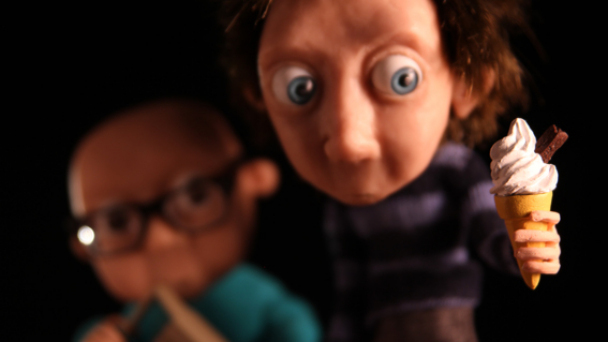 I am Tom Moody (2012, Directed by Ainslie Henderson) is a short animated film screened as part of the Snapshots strand at the Manipulate Visual Theatre Festival at the Traverse Theatre in Edinburgh. The short was introduced by Ian Gardner who chose the film as part of the strand, highlighting the work of recent graduates from the undergraduate animation course at the Edinburgh College of Art. I am Tom Moody screened along with an informative and entertaining ‘Making of’ documentary. Animator/Director Ainslie Henderson was due to appear, but could not attend the screening as he was appearing at the Bafta Awards in London, where he was nominated along with fellow ECA graduate Will Anderson for another short animation ‘The Making of Longbird’. I am Tom Moody is a stop motion animation that has a surreal and metaphysical edge. We are told the story of Tom Moody and how he battles his inner child. He is a musician who collaborates with his cousin Steven and we learn about their past and the struggles they encounter. 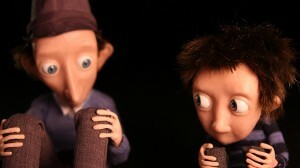 Throughout the film adult Tom (voiced by Mackenzie Crook) argues and talks to his younger self. Here the conflict in which the story is centred on is established and the life story of Tom is weaved around this. From a visual perspective the character design of Tom Moody makes the film stand out. Subtleties in facial animation and expression present the shyness and introvert nature of the protagonist, whilst the sparse background and set design firmly places the audience’s perspective on the character. Tom Moody has bright bold eyes and dishevelled hair, this makes him seem endearing along with his interesting and captivating story. The juxtapostion between young an old Tom Moody creates an emphathy that does not feel forced or contrived and makes the animation a joy to watch. Being able to relate to both the old and young character is a powerful tool that the film maker utilises to great lengths, despite the short time frame to do so. Henderson has created an animation that deserves to find a large audience and receive similar success to his previously mentioned Bafta winning collaboration. During the ‘Making of’ screening we uncover the hard work and labour that went to creating I am Tom Moody. This love and dedication is obvious in the film and definitely makes it stand out when compared to other graduate films.